Lada Granta sales started in late December 2011, and it has been the best-selling model on the Russian market for the last two months. Source: AP. Inspired by strong domestic sales of the Lada Granta, AvtoVAZ has decided to take its new model to Europe. The auto manufacturer said it would supply the car to select Western markets next year. Experts believe it will be popular among European buyers. AvtoVAZ said it would begin selling its Lada Granta model in Europe next year: in Germany, France, Serbia, Bulgaria, and the Baltic states, among others. “We are planning to sell the ‘regular’ and ‘luxury’ Granta models in 2013, both of which will comply with the Euro 5 emission standard,” the company said. ABS (anti-lock) and BAS (brake assist) systems, as well as two airbags and the ESP stability system will come as standard on the “regular” model. “It doesn’t make sense to enter Western markets without those features. The car will most likely be more expensive than the Granta intended for the Russian market, but cheaper than models from other car manufacturers sold there,” said Sergei Udalov, deputy general director of the Avtostat analytical agency. He believes the Lada Granta will be popular in crisis-ridden Europe. While European prices for the Lada Granta have not been announced yet, its most affordable version in Russia starts at 259,000 rubles ($8,176). Lada Granta sales started in late December 2011, and it has been the best-selling model on the Russian market for the last two months. AvtoVAZ announced several days ago that it had sold more than 100,000 models. 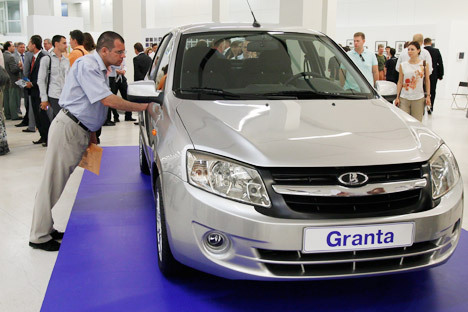 AvtoVAZ also started selling the Granta in former Soviet Republics in March of this year, three months after the start of sales in Russia. “We now sell the car in Kazakhstan, Ukraine, Belarus, Azerbaijan, Armenia and Moldova,” the car manufacturer said in a press release. According to Avtostat, some 7,000 Lada Grantas had been exported by the end of September. In total, AvtoVAZ exported 58,400 Lada cars in the first ten months of 2012 (including all models, minus the Lada Largus). Kazakhstan (49 percent), Azerbaijan (24 percent), Ukraine (15 percent), and Belarus (5 percent) are the largest importers of Lada cars. The company is planning to export a total of at least 65,000 cars by the end of the year. First published in RBC Daily.